Ken and I arrived by car with my cousin Sloba and his girlfriend Jelena, driving in from Belgrade, Serbia via Meteora (more on that spectacular place next time). The sailboat we rented from Jedrenje Grcka was moored in Lefkada town. 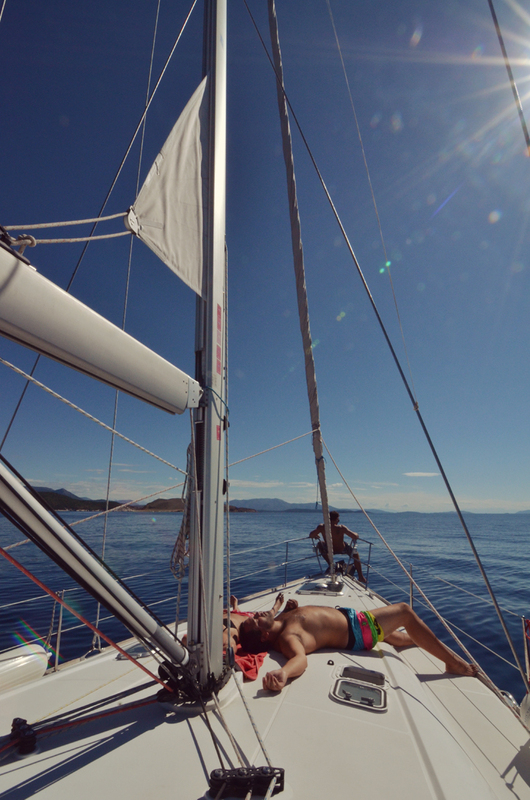 The plan was to spend the next week sailing around the small islands which dot the Ionian Sea on the west coast of Greece. Our crew was a mixed bunch: couples, cousins, friends of friends, and a few stragglers—9 in total. Some greeted every day with beer and cigarette in hand, swaying to clubby beats, while others were happier going for cleansing morning swims and reading. Luckily, our boating abilities were pretty mixed too. Ken and I came without any sailing knowledge, but there were enough people to show us the ropes, including an experienced skipper. The tone was set early—"be flexible"—we were truly along for the ride. The biggest deciding factor for where and when we'd be going was the weather. Some nights would be spent in secluded, wild coves, while at other times a strong gale would force us to find a sheltered marina. We spent many hot, lazy afternoons perfecting goofy dives and stiff cocktails. In contrast, other days were filled with nautical problem solving. Early on in Sivota, a storm dragged our sailboat across a small bay causing our anchor to collect rusty old ones along the sea floor. It took our skipper a day and a mini diving expedition to wiggle out of that one. On tiny Kalamos, we were greeted by George who seemed to run the marina, and as it turns out the rest of the island too. While most cafes and restaurants sat near-empty—it was late September after all—George's tavern was bustling. Each sail-in visitor was obliged to pay homage to George in lieu of a mooring fee, while he proudly strolled between tables greeting people and puffing up his chest. 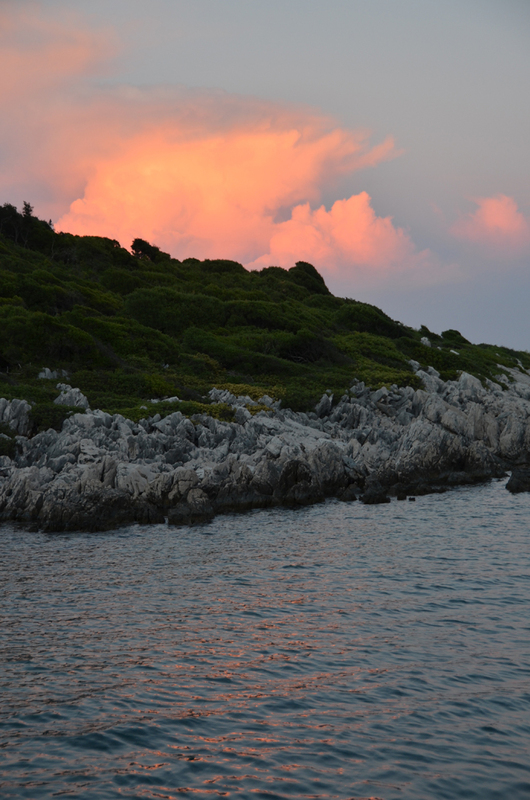 In Meganisi, we went for an evening swim in a secluded cove. The water stayed warm late into the night. And as the moonlight began to disappear we noticed a flickery glow emerging all around us from the water. Was the ouzo causing us to hallucinate? Nope. Thousands of tiny bioluminescent plankton lit up at every movement of our bodies. I had the sensation of swimming in a starry sky. Kefalonia was our first opportunity to spend the day on land. We jumped at the chance to explore, renting motorcycles and disappearing into the hills. Our first stop was the breathtaking but tourist-laden Melissani, a caved-in cenote filled with a mix of fresh and salt water. After that, we followed the windy mountain roads down to Myrtos bay, Kefalonia's most beautiful beach surrounded by marble cliffs. 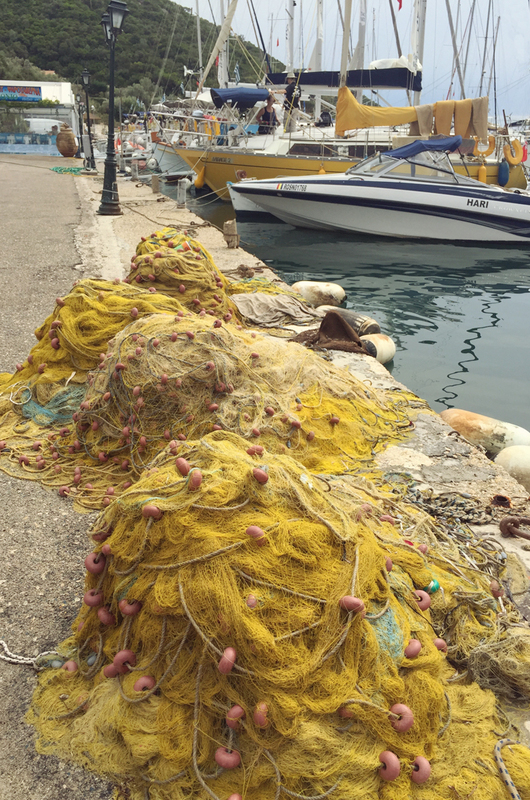 Since the afternoon was winding down, we decided to keep going to Fiskardo, a quiet fishing village. We would have the most delicious Greek dinner there, at Tassia restaurant. (I'd recommend fresh mussels and octopus, the best I've ever tasted). But what we didn't count on was that weather would once again intervene. The clouds thickened and far off lightning could be heard just as we raced to our bikes. Thankfully, a genius among our crew convinced us to cover our beach wear with garbage bags in case the storm hit as we rode. And boy did it ever! Lightning lit up the mountain passages as Ken wiped the rain off his visors face, while I sang on the back at the top of my lungs—a sort of distraction DIY radio. We made it back safely, soaked to the bone. The temperamental weather continued through the night and we spent the next day, our last, being tossed around the waves and napping in the hull, in order to get back to Lefkada. The journey was unpredictable, but made richer for it.